Blog - Concrete ready-mix producer and concrete road construction company, Lorain, Ohio - Terminal Ready-Mix, Inc. 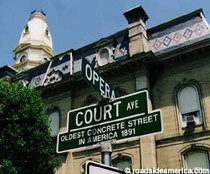 Concrete road construction in Ohio and the United States began in Bellefontaine, Ohio in 1891 when Court Avenue was paved with concrete by George Bartholomew. The original dirt road could not hold up to the rain and horses that constantly created ruts and mud. City Council was unsure of the proposal because concrete road construction was untested. Not even New York City had constructed concrete roads. So, in 1891 they allowed George Bartholomew to construct a "test" section 8’ wide next to the hitching posts by the court house. In 1893, council permitted the pavement of all the streets surrounding the courthouse, including Court Avenue. The roads were about 6-inches thick and the slabs were formed in 5 foot squares with tar paper between adjacent slabs. Still cautious, Council required that George donate the concrete and post a $5,000 bond to ensure that the pavement would last for 5 years. That’s $122,000 in 2010 dollars! The concrete required only $1,400 for maintenance in its first 50 years! Today, a concrete statue of George Bartholomew stands at the western end of the street, both to honor the pioneer and the close the street to motor vehicles. In 1893 he was awarded First Place for Engineering Technology Advancement in Paving Materials at the Chicago International Exposition. Terminal Ready-Mix, Inc. has specialized in concrete road construction for over 56 years. Our techniques and equipment have evolved over that time. We utilize slip-form concrete road paving equipment to construct concrete roads for subdivisions, concrete municipal streets, and large commercial and industrial parking lots. Contact us today to learn how we can help with your projects. (440) 288-1717. Is it safe to de-ice concrete surfaces using rock salt? Exterior concrete should contain air-entrainment. This is a chemical admixture added to the concrete during production to improve freeze-thaw durability. Concrete should properly cure before de-icers are used. Therefore, it is recommended that de-icers NOT be used during the first winter of new concrete. Use sand for traction in place of melting the ice. Do not use fertilizers as a salt-alternative. Do not use de-icers on porous or improperly cured concrete, precast concrete items, masonry, mortar, wood or other porous materials. Use only on properly placed, cured and sealed, air-entrained concrete. Concrete is a porous material which means it absorbs water. When brine created by melting snow and ice seep into concrete, this "saltwater" increases the amount of freeze/thaw cycles the concrete goes through. Eventually, this weakens the concrete and can cause the concrete to fail. This can happen when the refreezing of the brine causes pores to enlarge and even pop, pit, or spall. Proper production, placement, and protection of concrete will ensure that de-icers can be applied safely and effectively after the first year. If you need concrete sealer, or have any other questions related to salting new concrete, please contact us.